This comfort food recipe is from my friend Christine Knapp Curtis in Florida. 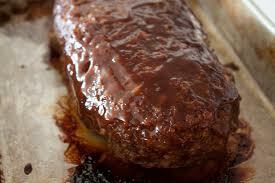 I like to serve Meatloaf with mashed potatoes and creamed corn for supper. Everyone has their own recipe for meatloaf and you can add lots of tasty ingredients to satisfy everyone’s individual preferences. We don’t particularly care for onions in our house but when I do use them, I like to use a white onion. White onions are not as strong and my family doesn’t mind them. Very simple and very good!!! Mix all ingredients except 1/4 cup of the BBQ sauce. Shape into loaf into a 12×8 baking pan. Bake at 375 degrees for 45 – 50 minutes or until cooked through. This is a cool blend of brownies and my family’s favorite buckeye candy. What a winning combo!! Preheat oven to 350 degrees. Line baking sheet with parchment paper. In a medium bowl, combine brownie mix, butter egg and cream cheese. Stir until dough forms, it will be very thick and sticky. You may have to use your hands. Form rounded tablespoon size balls of dough, placing them on the baking sheet about 2 inches apart. Make an indention with your thumb in each center. In another bowl, stir peanut butter and powdered sugar. 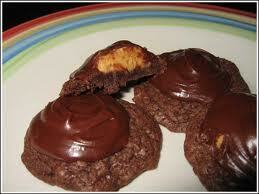 Form into teaspoon size balls and press into indentions in the brownie cookies. 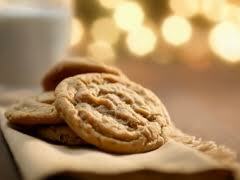 Press the peanut butter down slightly as it will not spread and you don’t want your cookies too tall. Bake 10 – 12 minutes until edges are just set. Cool on wire rack. When cooled, frost each cookie with a tablespoon of chocolate frosting. You may make your own frosting or use store bought. I have used both and actually prefer the Betty Crocker Chocolate Fudge frosting best. This was the first cookie recipe I tried after we arrived in Bode Iowa; in September 2010. My son doesn’t care for bananas, but he loves these cookies! He doesn’t know they have bananas in them! I have made them in all 4 seasons…..they are tasty anytime of year!! Preheat oven to 375 degrees. Spray baking sheets with vegetable cooking spray. Combine flour and baking soda in a small bowl. In a medium bowl, beat together banana, brown sugar, margarine and peanut butter until light and fluffy. Mix on medium speed. Beat in egg and vanilla. Gradually beat in flour until a dough forms. Shape into 1 inch balls, 2 inches apart on baking sheet. Using the floured tines of a fork, press a criss cross pattern. Bake cookies for about 10 minutes or until edges are set. Place cookies on wire rack to cool. Makes about 45 cookies. This delightful Ham would make a great Easter dinner main course! It is pretty simple too!!! Pre heat oven to 325 degrees. To prepare ham for glaze, once made, use a shallow pan on bottom 1/3 of oven. Using a sharp knife, score fatter side of ham in diamond pattern. Place ham face down in pan. Cover loosely with foil. Roast 1 1/2 hours. Mix preserves and mustard. Reserving half. Remove ham and brush with glaze. Continue to bake uncovered for 1 hour; brushing with more glaze every 20 minutes or so. Cook ham until an instant read meat thermometer reaches 160 degrees or higher.Remove ham from oven and let it rest for 20 minutes. Slice, transfer onto platter and serve with remaining preserve mixture. Serves 8 with plenty of leftovers. This looks deelish! Just got back from grocery store and making it tonight!! To share my love of cauliflower in all its forms, I promised there would be several variations of cauliflower soup. Today’s recipe is the first example, and it’s dedicated to all of you out there who prefer the green crucifer to the white. This soup is just as delicious as basic cauliflower, but including broccoli in the mix is a little twist that adds style and lends a pretty green hue. Both flavors come together beautifully in a creamy, heart-warming soup that’s perfect for cool spring days. The steps are pretty much the same as described yesterday, so today I’m posting just a few brief notes and cooking photos. 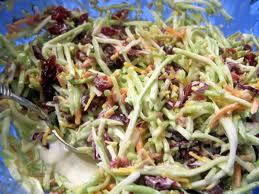 My family enjoys this slaw during the summer. It is quick and delicious! You may double the recipe for large gatherings, just make sure you have extra “slaw” dressing. Mix all together then refrigerate. Use 1 bag of slaw to 1 jar of slaw dressing. Add Raisins, Sunflower meats , Pineapple and Apples to taste. If using apples, peel and chop first. And if using pineapple; make sure its diced pineapple and drained.